The FPM-9020A model has been discontinued. Please see the DPU91-FLOW Series as a possible alternative or contact our Flow Engineering Department. 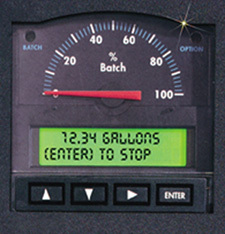 The FPM-9020A batch controller was designed for simple, single-function batching systems. A user-selectable menu allows easy configuration of current and relay options. One relay provides batch in-progress alarming, and the other can be used for a 2-stage shutdown, over-run alarm, end-of-batch, or missing signal alarm.